Use these printable worksheets, crafts, and games can be used to celebrate Earth Day (April 22). Kids can color and make this neat Earth Day hat. Color it in, put it together, and wear it around the school. It features a picture of the Earth and the words, "Happy Earth Day!" Make a smiling planet Earth with arms and legs that move. Color the Earth. Then cut out the arms and legs and attach them to the Earth with brass paper fasteners. Create a mini-book with ways to be kind to the Earth. Picture of a plant. Label all of the plant parts - roots, stem, flower, and leaves. Older kids can label parts and describe their functions. It's a beautiful day and all Miranda can think about is riding her bike in the park with her best friend Meredith, but Meredith has plans to plant trees for Earth Day. Can Meredith help Miranda see the importance of Earth Day? This non-fiction article describes the importance of recycling. Students will also learn how the recycling process works. Students will enjoy this cute poem about different species of trees. The poem is written at a fourth grade reading level. Find out how energy from the sun can create electricity. This passage is written at a 3rd grade reading level. Read the article about Wonderful Walnuts and answer the reading comprehension questions that follow. This article is written at a 4th grade reading level. 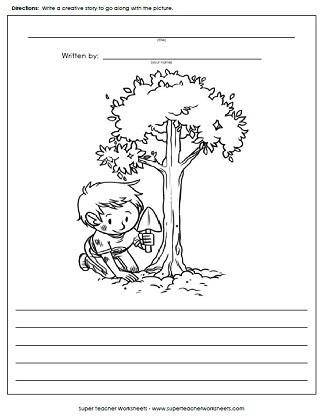 This worksheet has a picture of a boy planting a tree. Color the picture and write a creative story to go along with the illustration. Solve to find the answers to the basic addition facts. Then color according to the key to reveal an Earth Day picture. Find the sums of these three-digit addition problems. Graphics include a picture of the Earth. There's also an Earth Day word problem. Add to find the sums, then use the answers to glue the picture puzzle together. Solve to find the answers to the basic subtraction facts. Then color according to the key to reveal a picture of the planet Earth. 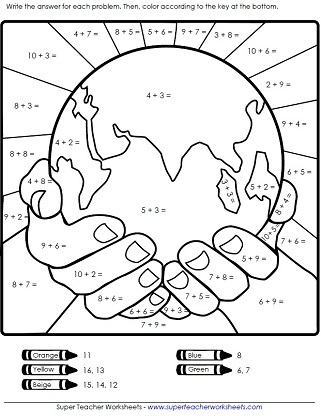 This 3-digit subtraction worksheet has Earth Day graphics and a word problem about planting trees. Subtract the four-digit minus three digit subtraction problems. The complete the puzzle based on the answers. Write the product for each basic multiplication fact. Then color according to the key to reveal a picture of the Earth. Complete the three-digit by one-digit multiplication problems. Then complete the cut-and-glue puzzle. Write the product for each basic division fact. Then color according to the key to create a fun Earth Day picture. Find the quotients for each three-digit long division problem, then finish the cut-and-glue Earth Day puzzle. Solve these recycling word problems with your knowledge of decimal multiplication and division. Students will love this color-by-number Earth Day picture. Print spring word searches, math printables, blank calendars for kids, and reading comprehension activities. Your students will also love these printable Easter mystery pictures, crafts, and worksheets. This page contains dozens of interesting animal reading comprehension passages.